Care Packages for Soldiers: Troops Send Thank You Notes for Care Packages. Troops Send Thank You Notes for Care Packages. "Your girl scout cookie box arrived today! Thank you so much for sending them, the troops here absolutely love them! I've been passing them out to our guys who work the security gates in the blazing heat, and they always smile when they get something out here in the middle of nowhere." Your guys support is incredible! As far as stuff the things you are sending are right on, of course guys would love knives. 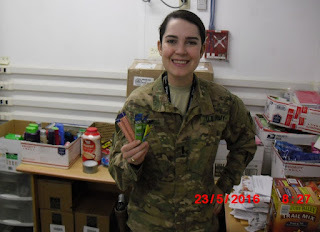 Care packages brought a smile to this soldier. 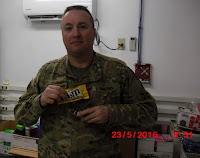 M&Ms made this soldier happy. 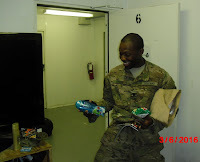 He looks very happy with the contents of this care package.